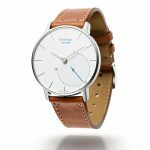 The Withings Activite is a Swiss-made watch, that includes activity tracking features built-in. It is, for all intents and purposes, a traditional analog timepiece. It comes with both a leather and silicone strap, so you can swap them out when you exercise. The watch is water resistant up to 50 meters or about 164 feet. It will track basic stats like steps taken, calories burned, and more. It can also track swimming workouts, runs, and sleep patterns. It syncs data via a companion app for Android and iOS.